When Nancy Judd recycles soda cans, junk mail and plastic bags, she doesn’t just haul them to the curb or to the closest drop-off center. The Santa Fe artist weaves the trash into dresses, coats, skirts and other haute couture. Among her creations are a 1950s-style cocktail dress and purse crafted out of canvas scraps and adorned with flowers, vines and leaves made out of aluminum cans; a faux fur coat made out of hundreds of feet of brown cassette and VHS tape; a skirt made out of plastic bags; and thousands of pieces of crushed glass glued to a 1930s-style gown. Judd’s foray into the world of trash fashion melds two of her passions: art, and a career heading up recycling programs in New Mexico and California. And what started as a gimmick to promote recycling in the City Different has grown into “Recycle Runway: The Airport Project,” an educational exhibit that travels to airports nationwide. Judd, the youngest of five siblings, grew up in Portland, Ore. Her mother was the director of the Pacific Northwest College of Art and owned an art gallery, and her father was an engineer at a natural gas company. Judd says her mother set up an art studio for her early on. “I made dresses for teddy bears when I was 5,” says Judd. “ I was just a crafty little gal, always doing things like making sculptures out of tin foil.” She developed an appreciation of vintage clothing while in middle school and used to tailor old garments to fit. Judd left Portland in 1986 to study sociology and art at Pitzer College in Claremont, Calif. During her studies, she took a year off to attend Laguna College of Art & Design (formerly the Art Institute of Southern California). 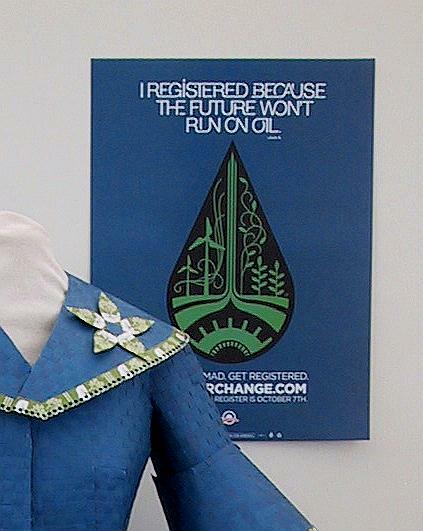 During the hiatus she helped launch a small-scale recycling program at the institute. Upon returning to Pitzer, she completed an independent study in solid waste management and after graduating was hired by Pitzer to launch a campuswide recycling program. She then worked as recycling assistant to the director of solid waste in Claremont and as recycling supervisor/coordinator for the L.A. Conservation Corps. In 1995, Judd took a position as recycling coordinator for the City of Santa Fe — a position she held until 2000 — and was then executive director of the New Mexico Recycling Coalition. While working with the City of Santa Fe, she helped coordinate the first Recycle Santa Fe Art Festival in 1999. To kick off the event, organizers held a trash fashion contest for the community, an event that’s in its 10th year. Judd has made a recycled material garment every year to promote the event. “(The garments) became more and more elaborate,” she says. The National Recycling Coalition then hired Judd to organize a recycled fashion runway show at its annual conference. Smaller recycling coalitions followed suit, and over the past seven years she has done shows in 25 cities in 10 states. Krebs says members of the National Recycling Coalition often work in the nonglamorous side of waste management. And that’s precisely where Judd’s work has served a purpose. Each garment takes between 100 and 400 hours to create, says Judd, and companies such as Coca-Cola, Toyota and Target (corporate partners of the National Recycling Coalition) have commissioned her to make many of the pieces. “Convertible Trashique,” commissioned in 2007 by Toyota, is an outfit made of convertible soft tops, electrical wire and front-end mask material that covers and protects the front end of a car, also referred to as a “bra.” “Pop-can Couture,” the 1950s-style cocktail dress made with aluminum cans, was commissioned by Coca-Cola in 2005, and Target commissioned her to make “Recycling Fiesta” in 2002, a Carmen Miranda-inspired costume fashioned out of plastic bags with the company’s red and white logo. But in 2007, Judd says she hit a crossroads. “I felt like if the project had this much momentum without putting much energy into promoting it, what would it be like to make it my career?” says Judd. So last year she began looking for venues to display the garments. The Albuquerque International Sunport was the first to take an interest. She displayed 12 recycled outfits in a large glass case there from Oct. 26, 2007, to Jan. 16, 2008. The New Mexico Environment Department was a major sponsor of the exhibit and posted educational boards about its recycling initiatives in New Mexico. Judd says she received confirmation that Hartsfield-Jackson Atlanta International Airport will house her work in 2009 and that Pittsburgh International Airport will host the show in 2008. The venues pay her expenses and a stipend, and Judd does additional fundraising to support the show. She recently hired a seamstress and sometimes hires local teenagers to help make the pieces. And as she creates more outfits, she says she will be able to do multiple shows simultaneously around the country. As for the crossroads, Judd says all arrows pointed in one direction: to further develop and market “Recycle Runway: The Airport Project” as her full-time occupation.